This is a Ruby script interpreter with base class extensions for program development. It was written over the course of the year to pool everything I had learned about Ruby during my 15 year journey. I have compiled this tool kit in the hopes to inspire people to take a new look or even a second look at the World of Ruby. Most of all the source classes I have included was based on trial and error. Learning is a fun road of mistakes and you shouldn't be afraid to make a few when learning something new. Make use of your failures and you'll find you succeed in the end. Most of the included classes are based from a collection of source material I have done with Ruby over my experance with it. I have complied a self contained interpreter for the syntax (Currently only supported for Windows). This is a working pool of Gems not created by me but are in use (Links to the documentation of each Gem is included for class reference). I do not take credit for any of those classes. All I did was present the use of said gems in a user friendly manor by showing examples of how the gems could be used in a productive environment. There are a handful of classes written in Ruby in the human readable source code that can be edited and interpreted on execution of DeskTop Garage. To develop a more in depth editing system, to also include a built in IDE that helps test code and debug before execution. Design a command shell to learn the basics of Ruby with interactive lessons. Version 0.2.7 10/31/2017 - Alpha Public Release. Version 0.3.2 12/28/2017 - Collision detection and controls. A complete history list can be found with in the download. 0.4.0 - Options menu screen. 0.4.0 - Full database editor. 0.5.0 - Interactive Ruby programing session State. Window classes. HUD, MainMenu, Pause Screen. Mappable button input that also supports 4 joy-pads. Map management, load new map, scroll map, manage screen objects. Player, NPC, MapObject class examples. Logger for quick resolves of runtime errors. Comments galore, Many things are labeled for the purpose of learning the syntax. Hyper links to gitHubs that helped shape the base class structure. Browse a built in HTML documentation database for all class functions and variables. Create new sound tracks and effects with the built in wave compiler. Design games with the built in tool kits! By downloading and using this tool kit you agree to the above conditions. 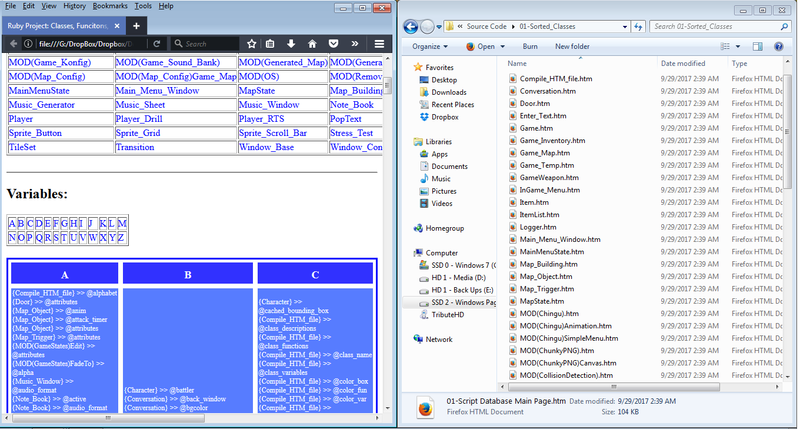 Follow the media fire link to the public source code folder where a copy of both, the source code and a compiled Windows excitable zip project can be found. Sorry about Adfly (i hate it), I use [You must be registered and logged in to see this link.] for my projects because its free, if you know of a better option for project sharing please send me a DM about it, thanks! A copy of the LICENSE is included in the download. Post any problems you may encounter, or a suggestion for a future update here in this topic. I will do my best to help resolve any issues and get you on the road to utilizing the API. DO NOT post this any where with out a link back to this thread, this will help people who have technical issues and hopefully get any resolved. You are free to edit in any way you see fit but NOT permitted to sell the source code for monetary gains with out a written agreement from Wiggles. Progress is being made, Both the 32bit and 64bit versions of the Microsoft Windows platform are completed. The data base editor is coming along nicely. A spell check and brief grammar over view and revisions have been made to the supplied documentation. any time but its used for debug discussion. * Most current build at the top of this list. Started the database GUI editor for things like souls, weapons, and items. Fixed map scrolling, screen X pos keeps up with advancing tile grid now. Compiled a 32 bit stand alone exe to allow the program to be ran on Windows XP and earlier systems. Fixed RTS player class, had a multitude of issues after many of the dependent classes changed. Re-Formated all source script indents and line dividers, also spell corrected along the way. Removed adult class from Window_Base class. Revised Run.rb and Ocra to work better when Running as an exe file. Corrected environment paths so the program can find working directory when asked for. Moved Logger into Run.rb and updated debug print events. Fixed potential memory leak with clearing $game_map.map_objects during map scene swaps. Added more settings to the Weapon Projectile classes. Fixed numerous problems with exe stand alone build, has proper debug logging now. Continued labeling working class files for quick references, nearly all have documentation now. Revised all loading directory location algorithms. Moved @image draw into character class base, made it use window factor setting. Cached the way that note grid cycle data image is drawn to reduce lag. Added in $controls class to manage all key/button mapping in one location. Made it so any HTM file with an empty function or variable list wont create empty text tables in file. Removed "Virtual Boy" tile-map mode. Made tile size setting more dynamic. Fixed quite a bit of the spelling mistakes, still a few more classes to check. Added Win32API gem into the game. Built GameTools class for system specific operations and dll calls. Fixed tile collision when in platforming mode. Changed Battler to Soul class instead. Moved the main menu into a window class for easier layouts. Separated RTS play style from Game_Player into its own class. Added in console logger to log print string to file. Updated all the currently installed gems. Split the player class into two, one for the Drill game, and the other for 2D scrolling. Fixed Two_halfD drawing for tile map during drill game. Reduced lag with tile map scrolling, eliminated two each loop statements, MUCH BETTER. Added a gas tank for drill game, tied it into game over calling. Changed how the random tiles are created, handed it off to the TileMap::Tile class. Changed the way collision detection works for characters and tiles. Added in 2.5 Dimension loading for tile maps, gives illusion of tile depth bey drawing multiple layers on a Y skew. Added properties and an update function to tiles for things like auto tiles, or tiles that move location in the map. Changed the flagging method for HTM compile to not require the repeated typing of the function name. Added a few more descriptions of use for the base scripts into the HTM compiler. Made it save individual note data for the audio compiler into sample .wav files when note book is saved. Changed a few things in TileMap::Tile cleaned up some un-used variables. Added a note editor GUI system for note cycle data changing. Moved some base Game Map functions into a working module. Random tile placement for map generator Tileset data is handed to game map then handed to tile-map. Added in some more checks into game player class to distinguish move properties on game type. 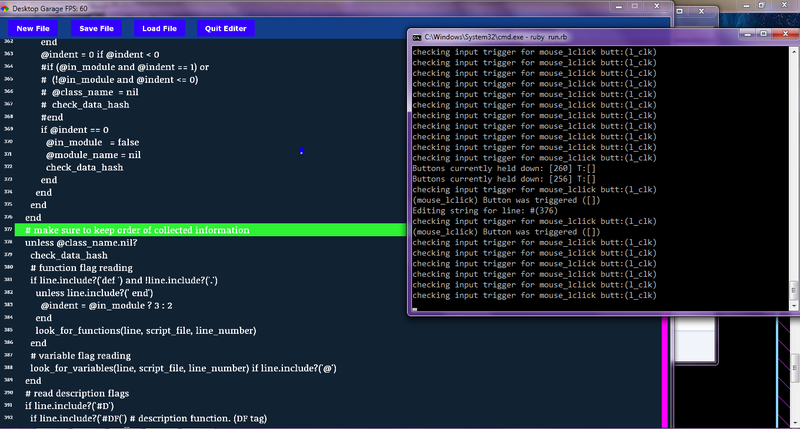 Added in multi channel functionality for audio compiler. Made possible the ability to load text data written to file for note data. Changed the way that map object data is loaded into game map. Separated tile map into separate files, did not change how the class handles data. Saving note book data and music sheet data to a text file format. Made the project capable of a stand alone exe development option for use with out the Ruby dev kit. Fixed script headers, labeled more class functions to HTM compiler. Added speed adjustments to Player animation display when running or walking. Changed the lay out of the music sheet GUI. Added in a load option for music sheet data. Sorted script data into a more organized fashion. Note and sound sheet management classes implemented into audio editor. Revised Window_Base mouse item systems. 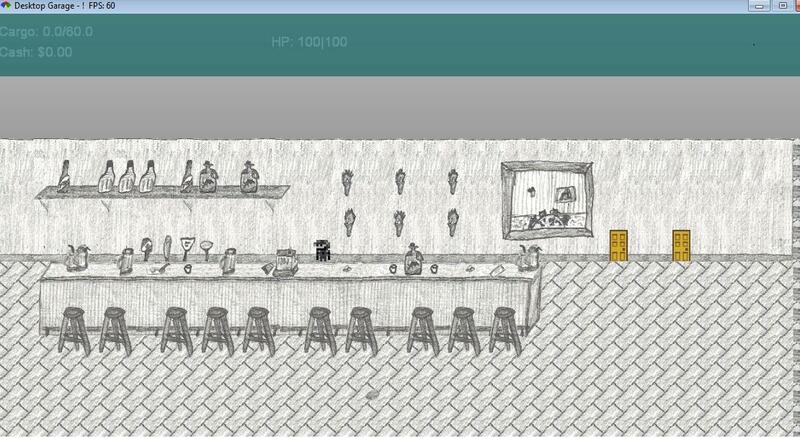 Added grid_draw sprite class for grid image drawing and table management use. Added an OS checking system to make changes if needed to program depending on running environment. Created a scroll bar sprite for window view scrolling. Added sprite Button for easier GUI creation. Added in mouse items (click-able button sprites) into Window_Base class for quick QUI creation. Created base class for Music_Generator class for Wave sound file manipulation. Added Game_Konfig module into Run.rb for managing global constant settings. character conditions to projectile hits. Fixed odd NPC firing angles for Projectiles when gravity is not equal to 0. Revised read me to include all to-date Tiled object tag functions and usages. Changed the way Animation objects work. Added Class descriptions into HTM compiler tagging for display in HTM database. Minor changes to HTM Compiler filter systems. Added diagonal movement to player class. Fixed HTM Compiler function and variable listing for modules. Added more features to HTM Compiler, things like Home Page links and Bottom Page. Continued Listing and labeling class Variables and Function information. Added Object_Animation for animation based objects for display on screen threw Game_Map. Changed GSB to GDB to include the data for image loading as well as sounds. Added Projectile hit detection for Characters, and follow threw effects on collision with NPCs. Fixed box detection for map triggers, now uses Tiled map object width and height values. Added more functionality to in game menu. - Added in basic attack functions. - Created a basic weapon database. - Added in more Tiled map data editor general map flags. - Changed how offset_y for screen character images works. - Mapped Xbox game-pad controls, added more functionality to controller input. - Added in NPC gravity properties for definable gravity, also fixed tile hit detection. - Added in basic map trigger functions. Changed the way the character moves on map, now when gravity is off player can move in all 4 directions. Worked on reducing Tileset map scrolling lag, skipped empty tile screen position updating. Finished priority flagging for tiles displayed on map for "depth" illusion, tweak-able later. Sat up a lag detection system for total map tile size and map plane size for when close to draw limitations. the Tile class itself speeding up scrolling and tile update times. Added float point gravity flagging to set GRAVITY value per map. Changed the way that gravity is read by Character objects in game. Returns player to main menu when falling out of map bounds. Added in stress test mode. Added 2 additional layers to the Tilemap class. Fixed another issue with game state stacking and not clearing properly, probably due to improved transition state. Transition state is working, just needs effects done. Changed resolution for game window, * looking to hot key full screen functionality. Strings drawn with images added. Working on a way for transitions between states to be improvised. * needs more work. DO A BARREL ROLL, * added in air jump animations. Added a new object, Door. You can now transfer between maps with it. Changed the order at which the input was binding the keys for states, think it fixed "ghost" walking at map load. Added in misc. error checking for loading maps for better debugging. Fixed a problem with NPC objects not being affected by gravity when MOVE_TYPE == 1. Fixed potential memory leak from improper use of switch/push game state function. Conversations actually work as intended now, still needs it's layout adjusted. In Tiled, you can now set properties for individual tiles in Tileset with things like PASS, PRIORITY, HURT. * Reversed the order of the build version details list in this read me. Added a .png Image editing gem for "in game" image manipulation. Added Image filters for use in game. Added new tags for Tiled map editor. < "check 'TestMaps\Read_Me.txt' for details"
You can also define character "skins" as well in Tiled threw the object editor in that program. Changed the way BGM is handled in general in the map state and moved it into game map global. Started layout of conversations classes for use in game. Using space now triggers events that have flags to do such. In addition to the above this build allows for the incorporation of maps to be loaded after being compiled. changed it carries that edit across all classes. Made some minor bug fixes with maps Dir, it finds the map in the 'TestMaps' directory now. Basic build, the start of the project. Gathering Gem Copy Rights and documentations. Not using too many gems, would be nice if everything was in one spot for referencing. Fixed NoClip mode for the $player class. Added more dynamic font loading by creating a media/font directory. Added "holding?" and "trigger?" functions to $controls and updated Input ID systems. Cleaned up draw lag in the Ruby IDE state. Started Ruby IDE state, a text file editor built for working with Ruby syntax. Fixed Sprite Grid finalize no super function and proper cell identity. Made a few changes to $controls. When I reach 0.4, which is when I hope to have the IDE working properly, all databases working and created for characters, weapons, and items in the editor. I'm thinking that I might just make a module that manages all different options for saving and loading data, Marshal dump/load, text based files, XML scripts. I'd like to get a GUI for conversation scenes as well, right now its hands on coding in order to make convos. These conversations because of the way the class is set up can be called from any place during the program. Making them not only us-full for NPC map interactions but also available for GUI tutorials. Going to work on a way to localize all string data for language support as well. Fixed Player related screen tracking when moving in a Tilemap. Fixed the sand tiles and the way they update in the tile set. Created Sprite Menu, a container for Sprite Buttons to support $controls input during menu display. Added a few more defaults for general use to the $controls container. Fixed the @offset_y of the Characters when drawn to map. Updated 'Script Information.txt' with additional info on Tilemap flags and settings. Started a generic TCP Networking class module. Fixed "falling" tiles, sand now falls in Miner 39'r. 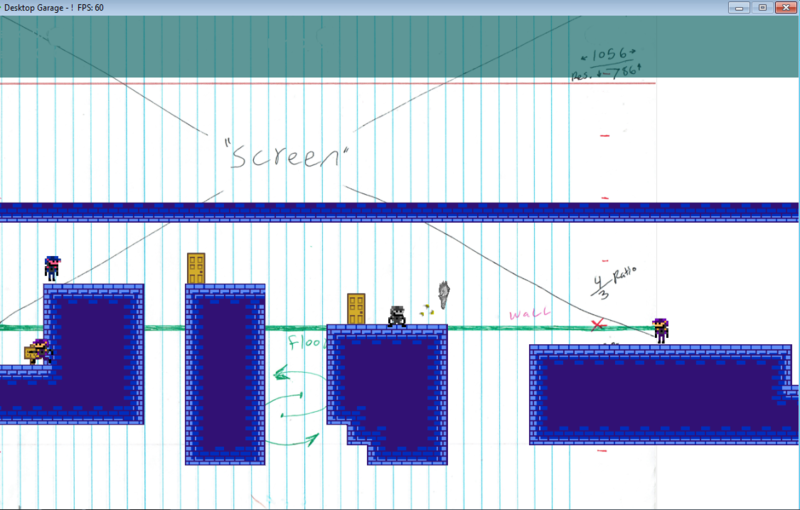 Fixed scrolling bugs for Sprite Grid class. Added in Loading scene class for the more lengthy State loading. New updates to be arriving soon. Its been a fight recently with quite a number of different things, but all is smoothing out again. Updates to be posted with in a week. Been very busy with work lately, time of that season again to make some money. When i find some free time i will update this post with a link to an updated version of project. I'd use get hub but i don't have $7 a month to use it. I can see about using media fire as a directory or Drop Box. Which do you guys think would be the better of the two? I would like to provide a way for people to browse the download as a directory so they can check the code before using it. I think i might just end up using drop box and provide a link to the files. I'm still working on concepts for scene managements, things like event handlers and some more GUIs for assisting in editing program data. I am planing on developing the system for use for games or programs. I am currently a bit side tracked with another project, STP (Squad Team Players) writing an AI administrator management system for Discord. It's close to its user testing phase and soon will enter beta state. I'm gonna see what i can get done tonight to provide people interested with the tools and equipment they need. hang tight and thanks for the patience. Turns out that drop box wont let you display public works for free, im just gonna use media fire and provide a raw source code link for browsing. Gonna be a while, i have slow upload speeds. Posted updates to mediafire, sorry about ad fly, if anyone knows of alternative options that are free to host files please let me know. Added additional stress test options. Modified the way the window class updates depending on OS window foregrounds. Changed the network update loop, added NetHUB window class and State. Started the RTS HUD layout, refined the RTS player class for units and buildings. Added Unit class for RTS styled games, sorted RTS based script classes. Created the basics for unit selection and commands. Continuing to build a refined tool set for Ruby program development. Might actually break down and buy a 1yr subscription to GitHub and upload the project there. ($50) Will keep you all posted on the developments as all ways. Ruby DeskTop Garage is still #1 on the list to complete and with a growing number of lines in the project (>15000) The Ruby IDE, and general base program creation classes are coming along smoothly. Still building this engine, Ruby 2.6 just cam out with a jit compiler (excited about that). Been talking with the developer of Gosu, the back end hardware gem that provides universal API calls to system. I have a github as well now so the source will be going up online soon. Last minute revisions and some restructuring to make DesktopGarage more strait foreword in its design structure.